On 22nd November 1976 Harold Loyd, Elvis Presley’s chief of security was greeted by an unexpected visitor who pulled up at Graceland and asked to see Elvis. It was Jerry Lee Lewis, accompanied by his wife, who was told that Elvis was asleep and so he drove off. 20 hours later, at 02.50, he returned, drunk, in a Lincoln Continental and brandishing a gun demanding they call Elvis. Instead of calling Elvis they called the police and Jerry was removed. He was not the first. Almost exactly seven months earlier, a less famous Bruce Springsteen, along with one of his backing singers, Steve Van Zandt did the same. They’d finished a gig nearby and jumped in a cab and asked the driver to take them to Graceland. Bruce got out, jumped over the fence and when apprehended by a security guard asked, ‘Is Elvis home?’ only to be told that he was in Lake Tahoe (which was apparently true). When asked what he wanted, Bruce said, that he was recently on the cover of Time magazine and had a song that he thought would be perfect for Elvis. Security were suitably unimpressed, particularly by Bruce’s scruffy appearance, and escorted him back out of the gates. Bruce went on to be a huge rock star and his debut UK hit is the subject of this week’s Single of the Week. 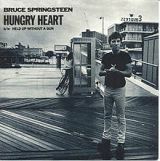 Bruce’s success at this time had been minimal; he’d released three albums, the first two, Greetings From Asbury Park and The Wild, the Innocent & the E Street Shuffle, both in 1973, had failed to set the world alight and his third, Born To Run in 1975 did better in the States than it did here. He really broke through on both sides of the Atlantic in 1980 when his album The River, a double album no less, shot to the top in America and number two in the UK. The lead single was Hungry Heart which made number five there and a lowly number 44 here. Bruce had written 60 songs for the album, so the hardest job was whittling it down to the 20 that did eventually make it. Hungry Heart tells the story of a man who wanted the best of both worlds; to be free and travel to wherever he likes but also wanted to have a stable family life. When it came to recording the song, Bruce wanted a slightly higher vocal than he’d laid down, so instead of re-recording it, he did what Bob Dylan had done on his 1969 hit Lay Lady Lay and that was to speed up the vocal. The two backing singers on the track were Mark Volman and Howard Kaylan who had both been a member of The Turtles. The B-side was Held up without a Gun, one of the 40 songs not used for the album and thus hopefully enhanced its chances of selling more copies which may well have worked in America. In a 1981 Rolling Stone magazine reader’s poll the song was voted best single and two years after that it featured in the film Risky Business, the first Springsteen song to appear in a film. It wasn’t to be the last, it cropped up again in the 1992 Hugh Laurie, Stephen Fry, Emma Thompson and Kenneth Branagh comedy drama Peter’s Friends, the in Adam Sandler’s 1998 comedy The Wedding Singer and finally in 2000 in the George Clooney and Mark Wahlberg adventure The Perfect Storm. Bruce had to cancel a number of dates on The River tour due to ill health but he finally made it to the UK in 1981 for a couple of nights in London. At the same time, he plucked one of his favourite singers from the sixties, Gary U.S Bonds, from obscurity and recorded and produced an album with him which included the hit single This Little Girl which Bruce wrote. The week This Little Girl peaked at number 43, Bruce entered the chart at number 69 with his own follow-up single, The River which the week after would climb to number 43 and then end its chart journey one further week at number 35, some nine places higher than its predecessor.